The planned mid-January release of Office 2008 offers a significant overhaul of the productivity suite's look and features. 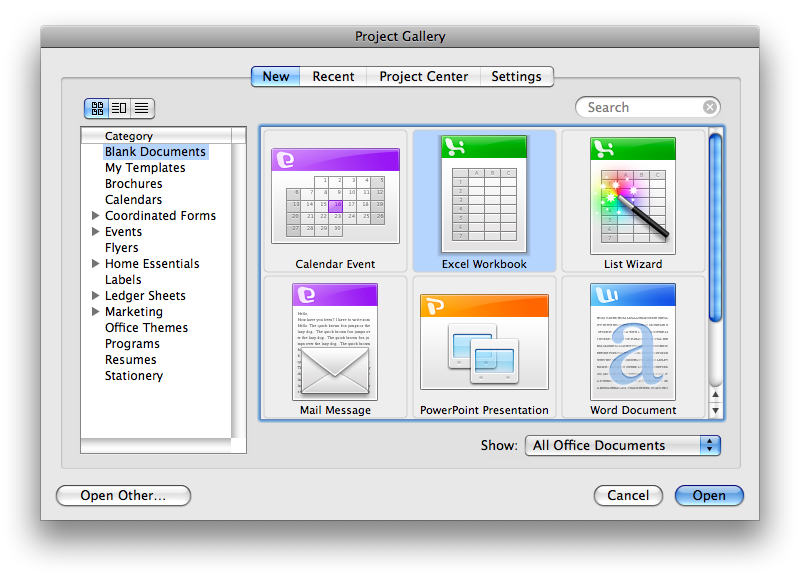 The previous segment described new features in Word 2008, with some comparisons to Apple's Pages 08. 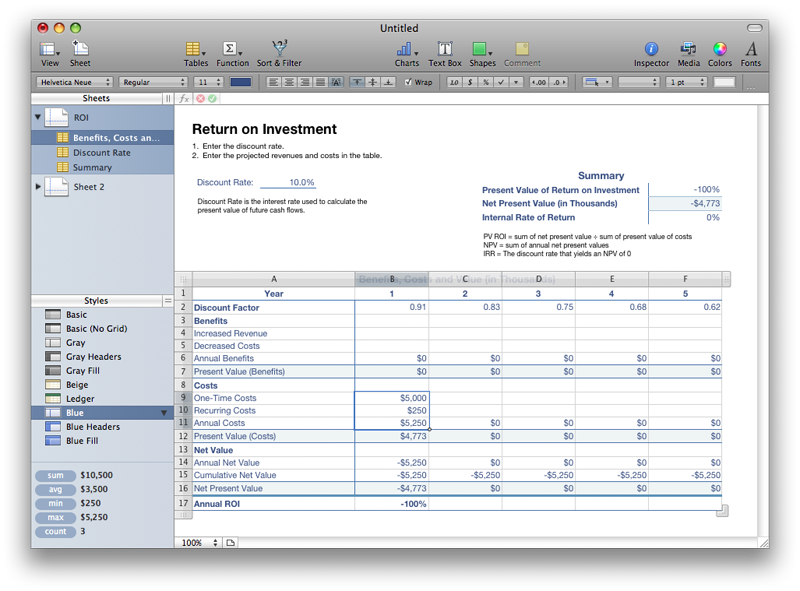 This article examines what's new in Excel 2008 and contrasts Microsoft's oldest application to Apple's newest: the Numbers 08 spreadsheet included with iWork. Excel was Microsoft's first desktop application and is widely regarded today to be its best. 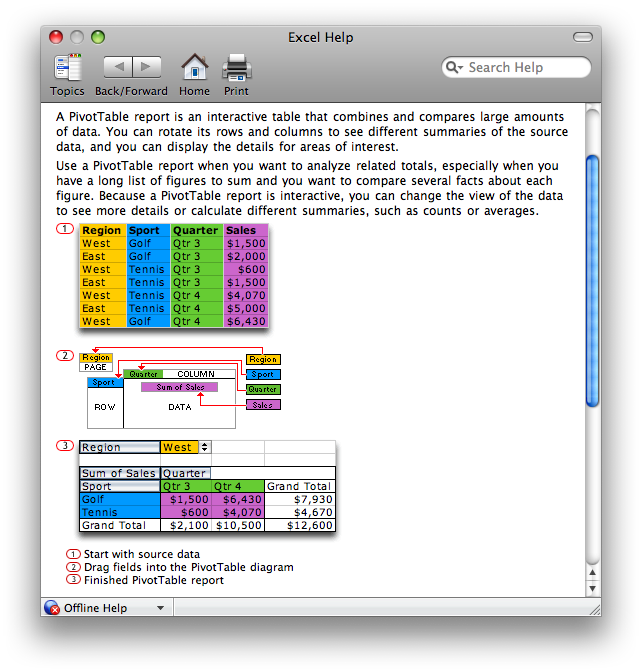 As described in Road to Mac Office 2008: an introduction, Excel was originally sold under the name Multiplan for a variety of text-based computer systems in the early 80s, including the Apple II, Commodore 64, and TI-99/4A. Multiplan was largely a clone of 1979's VisiCalc, the first electronic spreadsheet. In 1984, Apple unveiled the Macintosh with advertisements touting its unique graphical interface. Those ads highlighted Microsoft among Apple's most prominent software partners on the Mac and cited a young Bill Gates noting that the Macintosh sets a new standard that "captures peoples imaginations," as noted in Office Wars 3. While Multiplan wasn't available until 1985, it beat spreadsheet leader Lotus to the Mac platform. Lotus delivered a graphical, simplified version of its 1-2-3 spreadsheet under the name Jazz that ended up as an embarrassing failure. Jazz never took off on the Mac in part because it was criticized for failing to properly adopt the Mac human interface guidelines. In contrast, Microsoft's Multiplan for Mac, renamed Excel shortly after its launch, delivered a familiar VisiCalc interface within a familiar Mac window, which quickly made it one of the most popular Mac software titles. Excel 2.0 migrated that familiar interface to the DOS PC world in 1987, piggybacked on top of Microsoft's new Windows 2.0 environment. By 1990, Excel had almost singlehandedly established Windows as important enough for PC makers to begin pre-installing on their systems. Nearly twenty years later, Excel has become the common language of number crunchers. It has preserved alive the legacy of VisiCalc with a nearly unchanged interface that is almost identical on both the Mac and Windows. While most Excel competitors have attempted to clone every aspect of the program, Apple's Numbers 1.0, released earlier this fall, takes a different approach. Like the other components of iWork, Numbers is template-oriented, providing users with a starting point for using a spreadsheet. Numbers also focuses on the needs of a specific market: home, education, and small office users who want a capable tool with easy and simple presentation features. The focus of Excel is much wider. That also makes it more challenging for Microsoft to deliver a version Excel tailored for the Mac; the program is more of a general purpose Erector set. Excel's wide range of users all have very different needs. Its core competency is in sorting, calculating, distilling, and presenting meaningful data from rows of information. Many of the people using for other purposes would really be better suited with more specific tools appropriate to their actual task. For example, users with simple presentation needs often get sucked into using Excel to layout text and graphics because its predictable grid makes alignment easy. The result is that information that should be in a simple presentation format now depends upon Excel. Further, while Excel offers the tantalizing ability to format its grid with outlines of boxes and gradient fills, its tools are not designed for general presentation, and are clumsy and time consuming to use for that purpose. At the other end of the spectrum are technical users who employ Excel to build complex documents that really demand the structure of a relational database. Creating and maintaining such monstrous projects are easy up to the point where it's realized that Excel is the wrong tool for the job, at which time it can be difficult to migrate the efforts invested in Excel into a more suitable application. That leaves Microsoft stuck with supporting a wide range of users in Excel, many of whom should really be using something better suited for their task. With Numbers, Apple doesn't attempt to match Excel's feature list, but rather aims at delivering spreadsheet functions for consumers in a revamped, approachable interface. Numbers breaks out of the old VisiCalc grid to instead mix number crunching with presentation features. Numbers isn't the first attempt to rethink the limitations of the old VisiCalc grid. In the mid 80s, Lotus began work that resulted in Improv, detailed in Office Wars 4. Rather than just providing a huge spreadsheet grid, Improv applied the idea of separating data, formulas, and views to add structure to spreadsheet analysis. Only the data itself lived in spreadsheet columns, organized into named categories. Formulas could act on that data by name, without requiring it to sit in specific cells of the grid. Views, whether tables, charts, or graphs, could be created independently from the grid. Improv caught the attention of Steve Jobs at NeXT, who championed it on his own platform and got involved in providing feedback on its design. Porting Improv from NeXT to other platforms was more difficult. On the PC, Improv competed directly against Lotus 1-2-3. In addition, the newness of Improv found resistance among users already familiar with the old VisiCalc grid in 1-2-3 and Excel. Brio Technology later created a Mac product called DataPivot inspired by Lotus Improv on NeXT. The spreadsheet was designed to identify patterns within spreadsheet grids that could be grouped and aggregated to assist in data analysis. Borland bought Brio and added the pivot table concept to its Quattro Pro for Windows, which somewhat ironically was also competing against Lotus 1-2-3. Microsoft later adopted the same data pivot concept in Excel under the name pivot table. It's much easier to illustrate than to explain how pivot tables work, as Excel's Help indicates (below). Numbers does not offer support for pivot tables. The Project Gallery that opens when Excel launches offers to create a new workbook or launch the list wizard, which is used to import data from an external file or database. 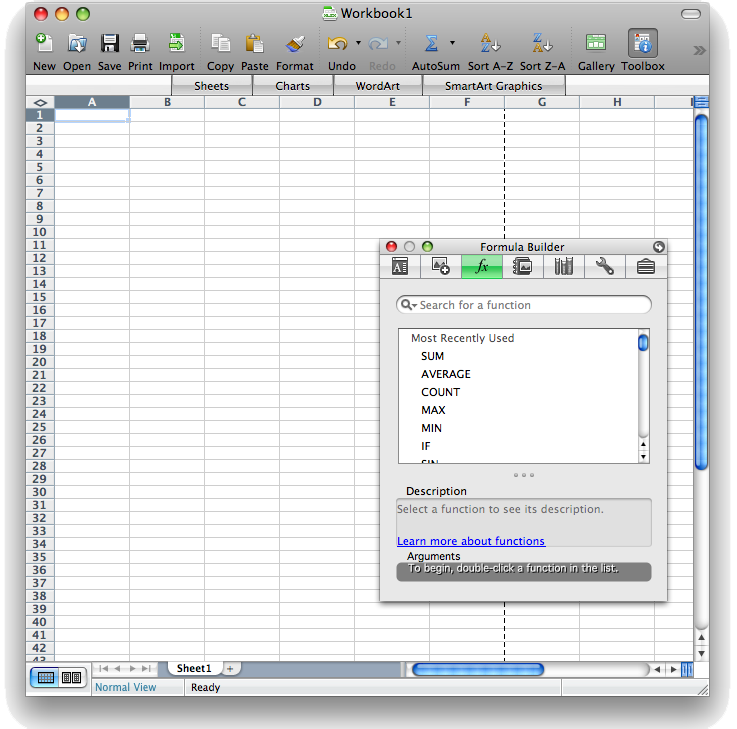 A workbook is an Excel spreadsheet document that can have multiple spreadsheet pages hiding behind its tabs. Just like the existing version, Excel 2008 presents its spreadsheet grid in two view modes: Page Layout View (above), which breaks up the grid to fit on printed pages, and Normal View (below), which presents an unbroken grid that stretches out for a page and a half, but will expand out to 65536 rows and multi lettered columns out to IV. The new Excel 2008 will also support the big grid introduced in Excel 2007 for Windows, with 1,048,576 rows and 16,384 columns. However, as spreadsheets get larger than a few printed pages wide, scanning back and forth over the huge spreadsheet can quickly become impractical. 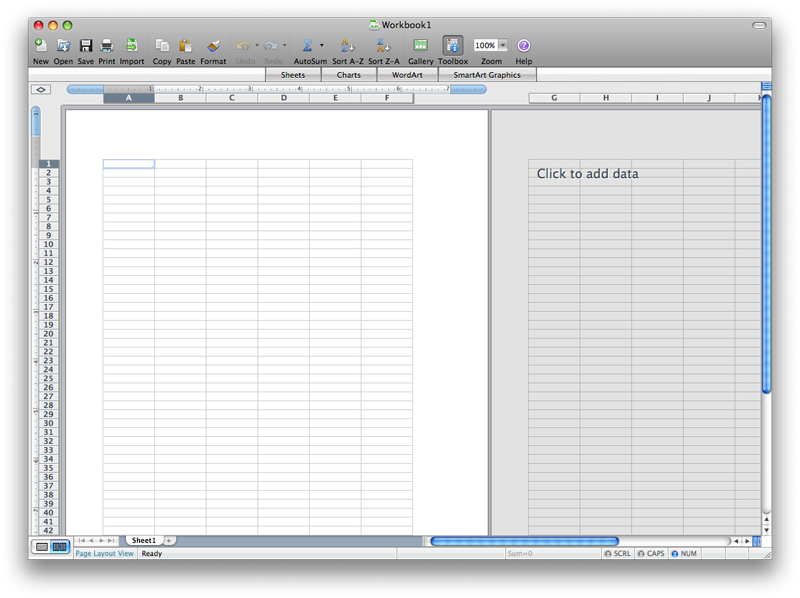 To solve this, Excel workbooks add new sheets in a tabbed interface at the bottom of the window (above). You can open multiple new windows that display different sheets within the same workbook, or partition the window into panes that show different regions of the same sheet. Within a sheet, the entire grid of each sheet is locked into the two coordinates, so if you want to float several independent calculations within the space of a page, you have to make sure they either line up correctly in columns, or fit into isolated rows and columns of the grid. This also demands some planning, because retrofitting a block of cells in between others might require shifting everything over or inserting new columns, either of which may upset existing fixed calculations based on cell assignments. Numbers works around this limitation by stripping the grid off the sheet. Instead, Numbers allows you to drop multiple spreadsheet tables on a sheet, each with its own independent grid. A Numbers document can incorporate multiple sheets, each with multiple independent tables. The ROI sheet (below), one of the supplied templates in Numbers, incorporates three tables : Benefits, Costs and Values; Discount Rate; and Summary. Selecting one of the tables from the sidebar (or clicking on the data within the table) activates that table for editing and draws the familiar rows and columns controls around it (below). A table can be expanded as desired, and rearranged on the sheet without breaking anything. Further, any selected cells are presented with a sum, average, and count along with the minimum and maximum values of the selection in the lower left. 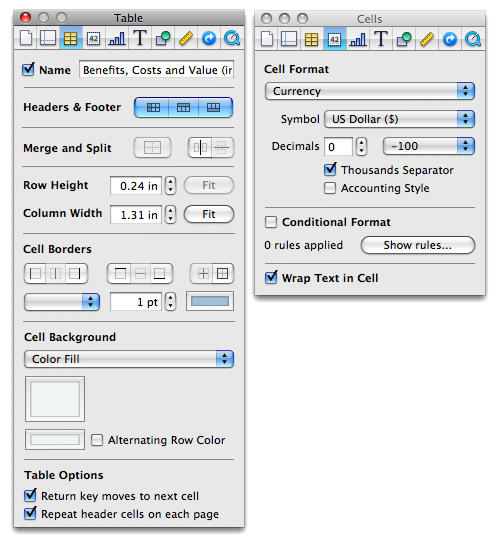 Above the auto-calculate area are styles (above), which make it easy to instantly impose a design format upon a table. Users can create and customize table styles and use them to quickly format plain data into attractive presentations without much work. Further editing of spreadsheet tables and cells is done using Inspector panels familiar to other iWork applications (below). Other related settings also appear in the contextual Format Bar, which sits just below the Toolbar (above). On page 2 of 3: Excel 2008 User Interface; Working with Functions; and Excel 2008 Templates.